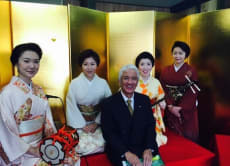 Hello, my name is Maiko, a Shamisen player in Japan. I started to play Shamisen at 8, and I majored in Japanese music in Tokyo University of the Arts. Now I am a professional Shamisen player and also give lessons. Please contact me if you are interested in Shamisen, and let's play Shamisen together! Play Shamisen with a professional in Asakusa! Experience playing Shamisen with a professional Shamisen player in Asakusa, Tokyo!